A Trip Update... Where Are We? The answer to that question over the last two weeks has depended on the weather. 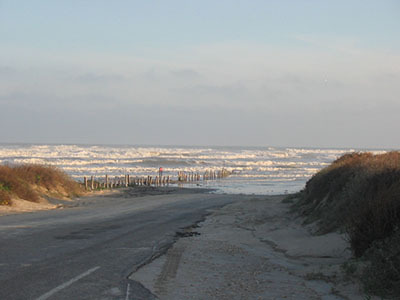 On the Texas beaches, it has almost literally been a case of blowing with the wind (or rain or sunshine). At least there was no snow! Since there's nothing to be done about the weather except to be flexible, we've had to adjust our plans as needed to make the most of it. We could choose to sit tight and wait out the rain and cold temperatures, or move on to an area that offers either better weather or more indoor activities. It's a side benefit of our style of leisurely travel. I don't know that many 1 or 2 week "vacationers" have this same luxury. This road leads to one of our favorite camping beaches. This photo was taken an hour before high tide. There was virtually no beach left to camp on for several days. We had no problem finding other camping nearby for only $5.00 a night. But the next day, with more rain and cold in the forecast, we decided to head to the Rio Grande Valley. The area, affectionately known as "The Valley", attracts hundreds of thousands of Snowbirds (Winter Texans) every year. Surely it will offer us sunshine and moderate temperatures. We did, in fact, get some beautiful warm days mixed in with the rain here and spent a perfect 2 day period at South Padre Island. 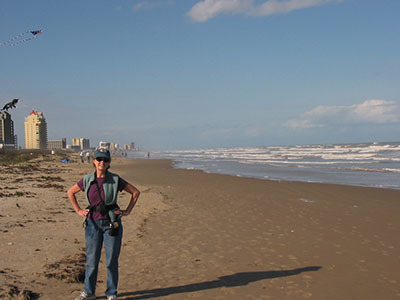 South Padre Island, the most popular of all the Texas beaches locations. We made the best of the cool rainy days with some cultural enlightenment. We took in some historical walking tours and visited museums in Harlingen and Brownsville. We even got ourselves included in a free annual "Welcome Back Winter Texans" party put on by the local chamber of commerce. Another passtime of course is shopping. A frgal traveler can't resist the bargains found across the border in Mexico. The popular border crossing at Progreso is where we could walk into Mexico for some cross-border shopping. A cool cloudy day was perfect for a walk in a nature park in hopes of sighting some new birds we may not have seen on the shore. 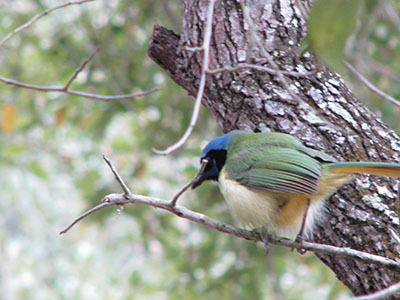 At a picnic area, we were lucky to spot some green jays. The Rio Grand Valley is the most northern habitat for this colorful bird. We also found the cool wet weather good for sleeping in, catching up on reading, writing, phone calls and emails home and spending some time at the local library. But lets be honest, bad weather is a downer on any trip! Now we're off to explore San Antonio, Austin, and the area known as Texas Hill Country. The forecast is for better weather. Let's hope it holds true.